North Carolina officials say the act was intentional. BESSEMER CITY, N.C. — A man intentionally rammed a vehicle into a North Carolina restaurant busy serving Sunday lunch, killing his daughter and another person and injuring several others, authorities said. Bessemer City Police said in a statement that preliminary evidence indicates the man purposely smashed his way into the Surf and Turf Lodge about noon Sunday. Footage from the scene showed emergency responders treating people on the ground outside the restaurant as shocked patrons milled about afterward. Killed was 26-year-old Katelyn Tyler Self, the daughter of the driver and a Gaston County Sheriff’s Office deputy. Authorities haven’t released the name of the second person fatally injured while they were still notifying relatives. 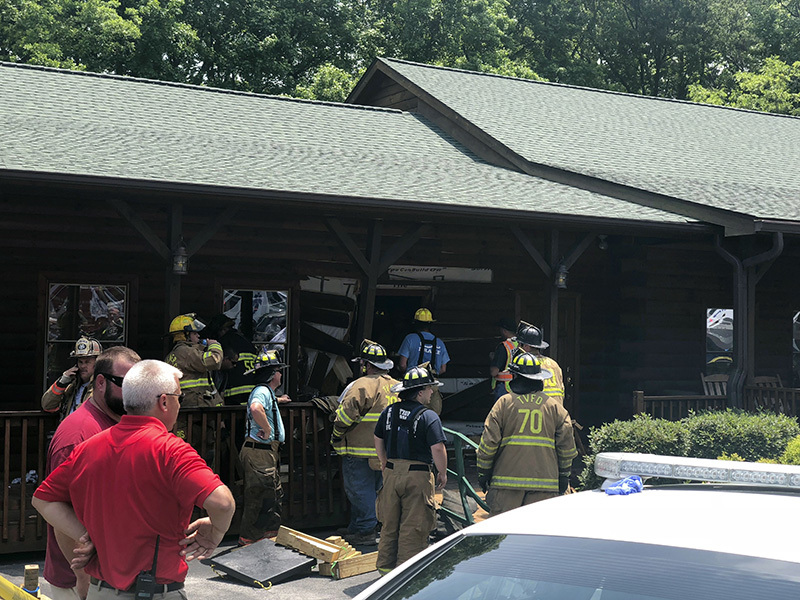 Police said the driver, Roger Self, was arrested after the vehicle had fully slammed its way inside the steak and seafood restaurant in Bessemer City, about 30 miles west of Charlotte. Authorities did not immediately make clear what charges Self faces. They said in their statement that they had begun a homicide investigation. The Gaston Gazette identified Roger Self as a businessman from Dallas, North Carolina. Charlotte-Mecklenburg police spokesman Rob Tufano called the crash a “mass casualty” incident, and reports said some of the victims were flown by helicopter to Carolinas Medical Center. There was no immediate count on the number of injured or the extent of the injuries. “He drove his car into the building, killing people, so that’s why we took him into custody immediately,” Bessemer City Police Chief Thomas Ellis Jr. said. He gave no indication what might have prompted the crash..
Katelyn Self was a four-year veteran of the Gaston County Sheriff’s Office, Sheriff Alan Cloninger told The Charlotte Observer. She had worked as a corporal in the jail and was off duty when she was fatally injured.